Kelly Thompson’s THE GIRL WHO WOULD BE KING is a strange little book. Slim and quick, the book follows a pair of young women who stumble upon ancestral god-like powers. The pair exist as a fixed duality: Bonnie Braverman is the good one, and Lola LeFever is the bad one. The book switches between their perspectives as both grapple with their newfound abilities. This book is one part homage to and one part send-up of superhero cliches. There are dead-parent-origin-stories and mad-cackling-at-oddly-named-henchmen. There are several explosive fights between the hero and the villain. This book has the strengths and the weaknesses of its specific genre, and for my money, it falls prey to a common issue: the villain ends up being so much more interesting than the hero that I ended up rooting for the wrong character. I gave this book three stars, and if I’m honest, it’s because I’m splitting the difference. Bonnie’s sections were a two. I found her flat, two-dimensional. She is an example of “goodness” reading as lacking in depth or complexity. She starts at least a little interesting: when the book opens, Bonnie is a silent seventeen year old living in a group home. She’s been in the system since she was six, when both her parents died in a car crash which she instinctively knows is somehow related to her shocking strength and speed. She stops speaking. She becomes a ghost in her own life, and then the power grows and pushes her to intervene, to protect the people around her. And then she . . . gets a boyfriend. And starts speaking. And works a quirky bookstore job and makes a quirky bookstore friend and becomes less and less interesting with each page. The fact that she spent literal years in silence is not addressed. The feelings of displacement and uncertainty she seems to feel from being an orphan and ward of the state clear up right quick. It is possible to write an extremely good character who is also very compelling and idiosyncratic (see Atticus Finch or Minerva McGonagall) but Bonnie is not that character. Standing in sharp contrast is Lola. Her story opens with a carefully plotted matricide. Her voice is immediately funny and heartbreaking at the same time, and the clumsy-witty sharpness of it does not let up once in the book. Her sections were a pleasure to read. The entire book is written in a stream-of-consciousness-lite first person-present tense, but Lola’s sections held much more immediacy and urgency than Bonnie’s did. Even as she falls prey to standard villain killers—madness, a moment of misplaced mercy, hubris—her voice remains distinct and arresting. Honestly, though, what drew me so much more towards Lola’s narrative than Bonnie’s is that Lola’s is, deep down, an abuse narrative. It’s about Lola trying to make sense out of what she is and how she was treated and why she was treated that way. Replace “superpowers” with “mental illness” and basically you’ve got my childhood (without the matricide). Lola’s story encapsulated a lot of questions I’ve spent my adult life asking myself: if my abusive parents and I share genes, but they also raised me, then what parts of me that are messed up are because it’s encoded in me and what parts are scars left over from all those years in that house? How could I possibly untangle that? Where is that fine line between compassionate acceptance of my flaws and permissive self-enabling of my destructive tendencies? If history has repeated itself for generations—my great-grandmother abused my grandmother who abused my mother who abused me—then is it even possible to break that cycle? Lola reminded me of myself at eighteen, fresh out of a crappy home life and trying to posture and swagger into a better version of myself without realizing all the posture and swagger were the worst things about me. She is a deeply real character, finely realized, and desperately tragic. I ended up rooting for her because in real life I rooted for myself. I kept hoping Thompson would subvert the Big Trope and pull a fast one on me—I very much wanted Lola to emerge as the good one, to have a redemption, to become sane and stable. That is not what happens. Well, she gets a redemption, of sorts, but it’s a hollow one. 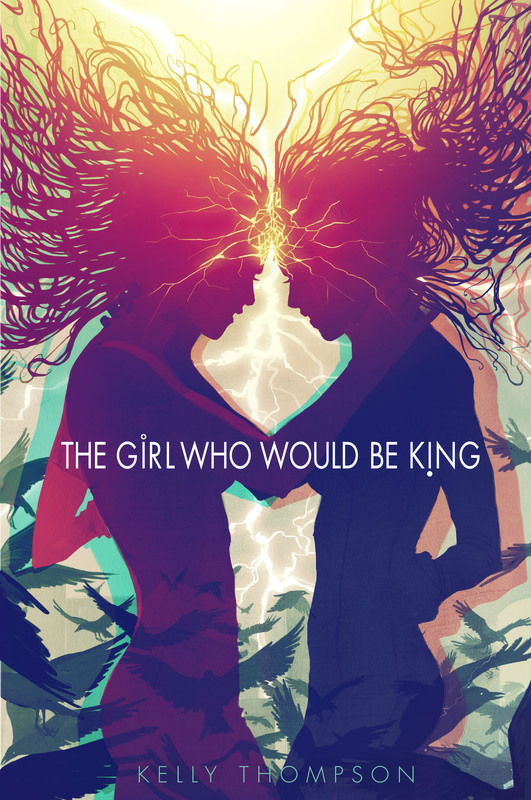 All in all, the GIRL WHO WOULD BE KING is a standard by-the-numbers retelling of superhero tropes with one truly standout character. This entry was posted in 3 stars, Book Review and tagged 3 stars, book review, Kelly Thompson, the girl who would be king by brsanders. Bookmark the permalink.